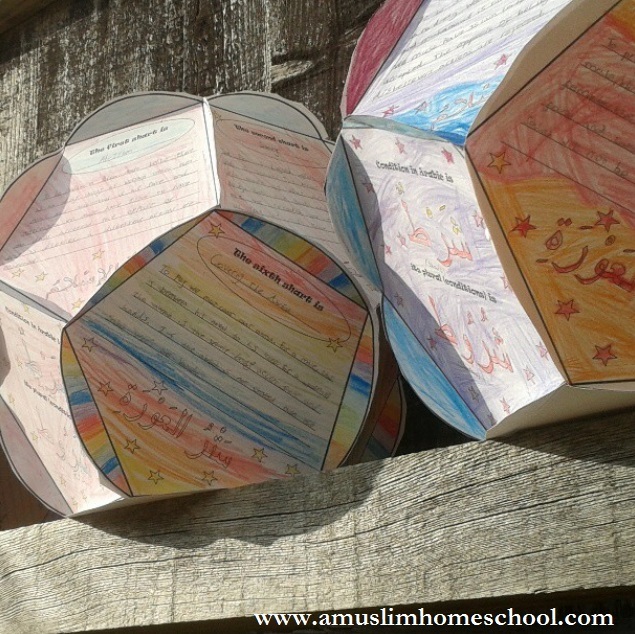 a muslim homeschool: The Shuroot of Salaah are 9: Giant dodecahedron! 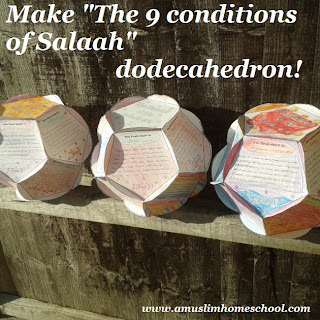 The Shuroot of Salaah are 9: Giant dodecahedron! Some of you reading this may not be home-schoolers, and alhamdulillah that's okay! As parents, we know that a lot of the "teaching" doesn't go on in schools, but happens in the home! One of the nice things about teaching your own children, whether you home educate them or not, is that you have the freedom to allow your little brood to be creative and use their imagination giving them opportunity to be more engaged in the subject activity, perhaps more so than school's have time or resources to allow. And as most of us want to ensure our children receive a good, sound Islamic education inshaAllah, many of us teach our children this with or without "school". Something which every single Muslim parent has an obligation to teach their children, is the salaah. How and where your kiddos "do school" is irrelevant, teaching our children to pray is a command we must follow. The question we need to ask is, is teaching our children the words and actions of the salaah enough? What about teaching them the things which make their salaah invalid or deficient? Its important to know these things to ensure we don't fall into them inshaAllah. If we perform the most beautiful salaah with near perfection, but haven't completed the wudu correctly, what happens to that beautifully made prayer? I don't need to tell you right! If you missed our previous post, we began working through An explanation of the conditions, pillars and requirements of prayer, making a small lift-the-flap-poster, to form a simple introduction to the shuroot of salaah. 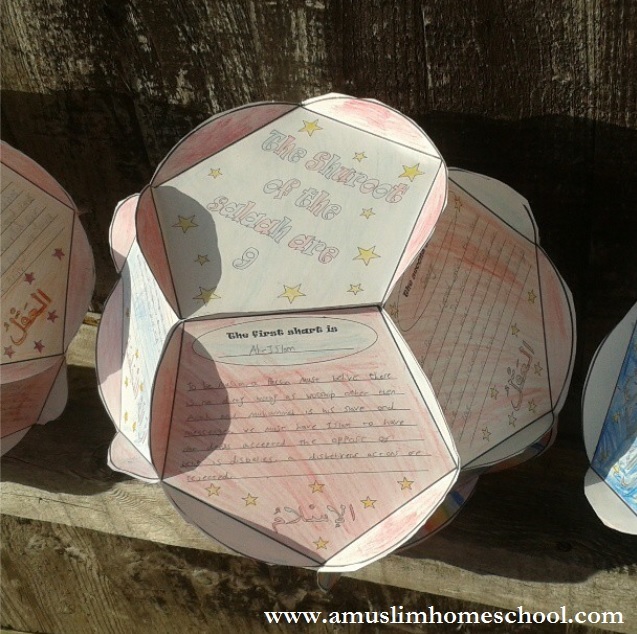 To ensure the kids have a reasonable basic understanding of these shuroot, we went over them again, this time in a little more detail, and with a fun twist......instead of just writing them out in a book, we put together a dodecahedron, with each shart on a different face! Having something so visual allows the kids to view their finished work on display, and should encourage them to pick it up, read and revise, so its clear in their minds inshaAllah. To put it together is very simple, print onto card (or print paper and stick ontop of card) cut out the circle, score the lines around the pentagon to fold, forming tabs, stick these tabs together! The tabs can be either folded inside the dodecahedron so are not viewable, or as we've done here, decorate them and stick facing out! You can download the template for this Free HERE!